Address: Square of Arts (in Russian - Ploshad Iskusstv), 1. The wonderful newly totally renovated (2007) Mikhailovsky Opera and Ballet Theatre is located close to Europe Hotel on the beautiful Square of Arts in the downtown of St. Petersburg. It is one of the oldest opera and ballet theaters in Russia founded in 1833 and presented by Russian Emperor Paul I as a gift (along with the Mikhailovsky palace) to his fourth son Grand Duke Mikhail (1798-1849). The building was designed by architect Alexander Brulov. In 1859 the stage was reconstructed by the prominent architect Albert Cavos, the designer of stages for Bolshoy (Moscow) and Mariinsky theaters. Since the time of its construction and untill October Revolution (1917) it was the private theatre of Tsarist family with temporary artists invited mostly from France and Germany. Its performances attended only by Russian aristocracy were assisted many times by the orchestra with Johann Strauss as the conductor. After the revolution the theatre formed its's own opera and ballet crews, choir and orchestra. The new theatre, founded in 1918, served as a research laboratory for the staging of operas during the 1930s under the name of Maly (Small) Opera and Ballet Theatre. At that time the theatre became an important center of musical culture of the city. During the Soviet days such popular Russian composers as Shostakovich and Prokofief presented here their famous opera and ballet premiers. 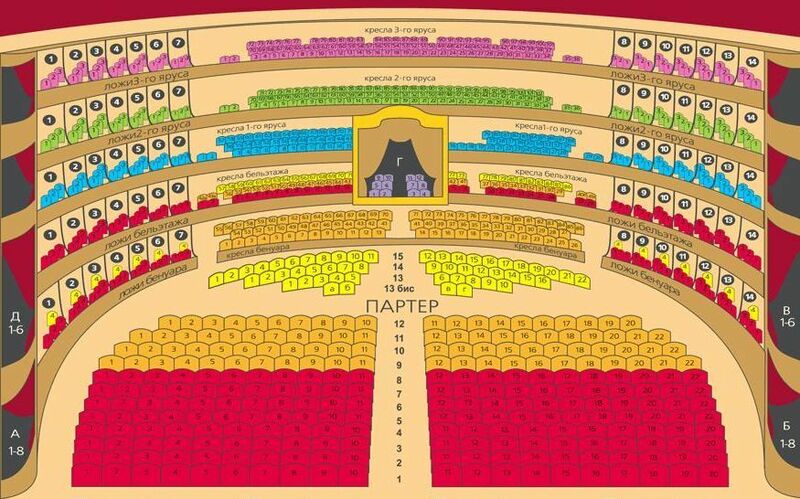 At different times in this theatre performed very famous characters in the theatrical world (Shalyapin, Lemeshev, Shostakovich, Temirkanov, Rostropovich, Vishnevskaya). Today the theatre team plays the most famous Western and Russian ballet and opera performances and the prices are lower than at the Mariinsky. The spectators from many countries enjoy its shows such as Boris Godunov, Prince Igor, The Queen of Spades, Eugene Onegin and others. The theatre is famous also for its elegant interior decoration.